Professor in the Department of Clinical Neurosciences at the University of Calgary in Alberta. Clinical Assistant Professor in the Department of Family Medicine at the University of Calgary. Research Associate in Health Technology Assessment at the Institute of Health Economics in Edmonton, Alta. Director of Health Technology Assessment at the Institute of Health Economics. Adjunct Clinical Assistant Professor in the Faculty of Medicine at the University of Calgary. Objective To increase the use of evidence-informed approaches to diagnosis, investigation, and treatment of headache for patients in primary care. Quality of evidence A comprehensive search was conducted for relevant guidelines and systematic reviews published between January 2000 and May 2011. The guidelines were critically appraised using the AGREE (Appraisal of Guidelines for Research and Evaluation) tool, and the 6 highest-quality guidelines were used as seed guidelines for the guideline adaptation process. Main message A multidisciplinary guideline development group of primary care providers and other specialists crafted 91 specific recommendations using a consensus process. The recommendations cover diagnosis, investigation, and management of migraine, tension-type, medication-overuse, and cluster headache. Conclusion A clinical practice guideline for the Canadian health care context was created using a guideline adaptation process to assist multidisciplinary primary care practitioners in providing evidence-informed care for patients with headache. The Alberta guideline is intended to assist any primary care practitioner responsible for the assessment and management of headaches in adults. The guideline’s main focus is primary headache disorders (eg, migraine, tension-type, and cluster headache) and medication-overuse headache. Some advice is also provided for the diagnosis and investigation of secondary headache disorders and the management of cervicogenic headache and temporomandibular joint disorder. The guideline will be helpful to a range of primary health care professionals, including family physicians, physical therapists, occupational therapists, nurses, nurse practitioners, pharmacists, psychologists, and chiropractors. The lead organizations involved in developing the guideline were Toward Optimized Practice (TOP), which develops and disseminates primary care guidelines in Alberta, and the Institute of Health Economics (IHE). Three multidisciplinary committees were formed to coordinate guideline production. The Steering Committee provided operational oversight. The Guideline Development Group (GDG) formulated the recommendations and comprised 9 family physicians, 2 neurologists, an osteopathic physician, a chiropractor, 2 physical therapists, an occupational therapist, a nurse, a pharmacist, 2 psychologists, and a health technology assessment specialist. The Advisory Committee advised the Steering Committee on strategic matters and included representatives from the Alberta College of Family Physicians, the Alberta College of Physicians and Surgeons, Alberta Health Services, Alberta Health, the Pain Society of Alberta, and a chronic pain patient advocacy group, as well as experts in guideline development and dissemination. The research team collaborated with experienced medical librarians to systematically search for existing clinical practice guidelines (CPGs) published between January 2000 and May 2011. The search identified 64 guidelines, 18 of which were deemed relevant after application of specific selection criteria developed by the research team and content experts from the GDG.11 The quality of the guidelines was appraised independently by 2 reviewers (C.M. and N.A.S.) using the AGREE (Appraisal of Guidelines for Research and Evaluation) instrument,16,17 which was modified to reduce the subjectivity of the item scoring and to enable the differentiation of good- from poor-quality guidelines.18 Although an updated AGREE tool was published in May 2009,19,20 the research team elected to use the original instrument in order to maintain consistency with previous guidelines produced by TOP and the IHE. Of the 18 potentially eligible guidelines, 6 were scored as good quality and were chosen as seed guidelines. Two reviewers (C.M. and N.A.S.) extracted the following information into standardized evidence tables: the source of the guideline, the recommendations, the number and types of studies used to create the recommendations (eg, 5 randomized controlled trials), and the strength of the recommendations. A total of 187 recommendations were tabulated. Discordant recommendations were highlighted in the tables. The GDG reviewed the 6 seed guidelines, their companion documents, and the evidence tables during 13 half-day meetings: 1 face-to-face meeting and 12 Web conferences using WebEx (Cisco Systems Inc), which allowed all GDG members to view documents simultaneously and to register their preferences using an online voting system. The 2 GDG cochairs (W.J.B. and P.T.) led all sessions and conducted roundtable discussions for every recommendation to ensure that each GDG member had a voice in the process. In some cases, the GDG requested additional evidence to resolve uncertainties or disagreements regarding interpretation of the evidence from the seed guidelines or when new interventions were considered that had not been included in the seed guidelines. These “parking lot” requests triggered examination of individual research studies cited by the seed guidelines, as well as additional systematic reviews on headache disorders identified by a supplementary search for literature published between January 2000 and October 2010.11 The parking lot items were referred for further analysis to ad hoc GDG subcommittees that included one or both cochairs, one IHE researcher, and at least one volunteer from the GDG with expertise in the relevant area. Consensus-based decisions made by the subcommittees were then presented to the GDG for final approval. Occasionally new recommendations were generated from parking lot item discussions. A special GDG subcommittee, which included a neuroradiologist, was created for the diagnostic imaging recommendations. The 23-month guideline development process resulted in 91 draft recommendations. Each recommendation in the Alberta guideline came from 1 or more seed guidelines, was based on evidence from systematic reviews or quasi-systematic reviews, or was created by the GDG members, based on their collective professional opinion and an analysis of relevant evidence. The original wording of the recommendations was retained whenever possible, and designations were used (eg, SR for systematic review, CS for case series) to maintain a link to the evidence cited by the seed guidelines. The principles outlined in the GuideLine Implementability Appraisal tool, which is designed for appraising the implementability of CPGs, were used as a guide when crafting the recommendations.21,22 Standardized definitions for the types of recommendations made in the Alberta CPG were constructed from the evidence-rating scales used by the seed guidelines. The recommendations were categorized as do when the evidence supported the intervention, do not do when the evidence suggested the intervention was ineffective or harmful, or do not know when the evidence was equivocal, conflicting, or insufficient. The draft guideline was reviewed by the Advisory Committee, a focus group of primary care physicians, and attendees at 2 Alberta physician conferences. The patient information sheets were reviewed by focus groups of patients and laypeople. The feedback was incorporated into the final documents, which were approved by the GDG in February 2012. The seed guidelines are listed in Table 1.23–31 The Alberta guideline’s 91 recommendations are organized into 6 sections. The full guideline and accompanying documents are available from the TOP website.10 The quick reference algorithm* information is provided in Figure 1 and Tables 2⇓ to 4.10 Some general practice points are summarized in Box 1. CBT—cognitive behavioural therapy, LOC—level of consciousness, NSAID—nonsteroidal anti-inflammatory drug. Migraine medications: A) Acute migraine medications. B) Prophylactic migraine medications. Medications for cluster headache: Consider early specialist referral. Based on expert opinion of the Guideline Development Group. Based on the Scottish Intercollegiate Guidelines Network guideline29 and expert opinion of the Guideline Development Group. Red flags and other potential indicators of secondary headache: Appropriate referral or investigation should be considered. This section of the guideline focuses on hemicrania continua, cervicogenic headache, and headache secondary to temporomandibular joint disorders. Treatment of these conditions will likely involve referral to an appropriately trained therapist or specialist. The guideline has been disseminated through presentations and workshops at provincial, regional, and national conferences. It is also listed in the CMA Infobase,34 where it was among the 10 most downloaded guidelines for nearly 6 months. It also appears on the Michael G. DeGroote National Pain Centre website35 and is listed by the US National Guideline Clearing House.36 A pilot project is under way at the University of Calgary in Alberta to present the headache guideline using interactive webinars. The evidence base for the Alberta CPG will be assessed annually and will be updated when new evidence is found that changes the recommendations. The lack of high-quality scientific evidence for headache investigations, diagnosis, red flags, and specialist referral meant that many recommendations in these areas relied on the opinions of the GDG or the experts who developed the seed guidelines. However, these issues were overcome by using credible seed guidelines, scrupulously listing the evidence type and source for all recommendations, and clearly documenting the subjective contextualization process. Adaptation processes are limited by the time lag between the publication of primary studies and their incorporation into guidelines, which means that recently published evidence was not necessarily incorporated into the Alberta CPG and that not all of the treatment options available were covered by the seed guidelines. To help offset this, the research team updated searches regularly throughout the Alberta guideline adaptation process. There was debate among the GDG members about incorporating newly emerging headache treatments that were not identified in the seed guidelines. A conservative approach was adopted whereby a recommendation for an emerging intervention was created only if it had been assessed in a systematic review. The format and brevity of the Guideline for Primary Care Management of Headache in Adults reflects its intent—to provide Canadian primary care providers across multiple disciplines with a comprehensive suite of resources for assessing and managing headaches in adults. A guideline summary and algorithm, as well as practice tools and patient information sheets, are provided to support comprehensive headache management that emphasizes patient engagement and self-management, as well as evidence-informed interventions. We thank the members of the Ambassador Program Guideline Development Group, the Advisory Committee, and the Steering Committee for their commitment and hard work. We also thank all of the organizations that provided support during the guideline development process, particularly Toward Optimized Practice for guidance in the final stages of the guideline process and for hosting the completed guideline online. Special thanks to Dr James N. Scott (radiology) and Dr Robert Ashforth (radiology) for their invaluable contributions to the diagnostic imaging components of the guideline. We also thank Ms Wendy McIndoo for administrative assistance and Ms Liz Dennett and Ms Dagmara Chojecki for information services support. Funding for this initiative was provided by Alberta Health. The views expressed herein do not necessarily represent the official policy of Alberta Health. Headache is a common reason why patients seek help from family physicians, and treatment is often suboptimal. This article outlines the development and key recommendations of the clinical practice guideline created by a multidisciplinary guideline development group to assist Canadian primary care practitioners with providing evidence-informed care for patients with headache. Migraine, which is historically underdiagnosed, is by far the most common headache type in patients seeking help for headache. Neuroimaging, sinus or cervical spine x-ray scans, and electroencephalograms are not recommended for the routine assessment of patients with headache: history and physical and neurologic examination findings are usually sufficient to make a diagnosis. Comprehensive migraine therapy includes management of lifestyle factors and triggers, acute and prophylactic medications, and migraine self-management strategies. Treatment of tension-type, cluster, and medication-overuse headache is also outlined. La traduction en français de cet article se trouve à www.cfp.ca dans la table des matières du numéro d’août 2015 à la page e353. ↵* The original quick reference algorithm is available in an easy-to-print format at www.cfp.ca. Go to the full text of the article online and click on CFPlus in the menu at the top right-hand side of the page. Dr Becker served on medical advisory boards for AGA Medical, Allergan, Merck, and Pfizer; received speaker’s honoraria from Allergan, Merck, Pfizer, Serono, and Teva; and received research support as part of multicenter clinical trials (served as local principal investigator) from AGA Medical, Allergan, Medtronic, and Merck. However, these interests had no influence on the design, data analysis, formulation, or content of the guideline. None of the other authors has any conflict of interest to declare.
. The epidemiology of primary headache disorders. Semin Neurol 2010;30(2):107-19. Epub 2010 Mar 29.
. Barriers to satisfactory migraine outcomes. What have we learned, where do we stand? Headache 2009;49(7):1028-41. Epub 2009 Apr 6.
. The burden of migraine in the United States: current and emerging perspectives on disease management and economic analysis. Value Health 2009;12(1):55-64. Epub 2008 Jul 30. Guideline for primary care management of headache in adults. Edmonton, AB: Toward Optimized Practice; 2012. Toward Optimized Practice. Available from: www.topalbertadoctors.org/cpgs/10065. Accessed 2013 Aug 26.
. Ambassador program guideline for management of primary headache in adults: background document. Edmonton, AB: Institute of Health Economics; 2013. Available from: www.ihe.ca/research-programs/hta/aagap/headache. Accessed 2013 Aug 26.
. Creating a multidisciplinary low back pain guideline: anatomy of a guideline adaptation process. J Eval Clin Pract 2011;17(4):693-704. Epub 2010 Sep 16.
. AGREE instrument. London, UK: The AGREE Collaboration; 2001. Available from: www.agreetrust.org/resource-centre/the-original-agree-instrument/the-original-agree-instrument-translations. Accessed 2013 Aug 26.
. AGREE II: advancing guideline development, reporting and evaluation in healthcare. CMAJ 2010;182(18):E839-42. Epub 2010 Jul 5.
. Appraisal of Guidelines for Research & Evaluation II. London, UK: The AGREE Next Steps Consortium; 2009. Available from: www.agreetrust.org. Accessed 2013 Aug 26.
. The GuideLine Implementability Appraisal (GLIA): development of an instrument to identify obstacles to guideline implementation. BMC Med Inform Decis Mak 2005;5:23.
. GuideLine Implementability Appraisal (GLIA). New Haven, CT: Yale University; 2005. Available from: http://nutmeg.med.yale.edu/glia/login.htm;jsessionid%20=DFE8740FF9FF152296DD79BFBAA723B6. Accessed 2013 Aug 26.
. Diagnosis and management of headache in adults. A national clinical guideline. Publication no. 107. Edinburgh, Scotland: Scottish Intercollegiate Guidelines Network; 2008. Available from: www.sign.ac.uk/guidelines/fulltext/107/index.html. Accessed 2013 Aug 26.
. EFNS guidelines on the treatment of cluster headache and other trigeminal-autonomic cephalalgias. Eur J Neurol 2006;13(10):1066-77. Available from: www.guideline.gov/content.aspx?id=34898. Accessed 2015 Jun 10.
. 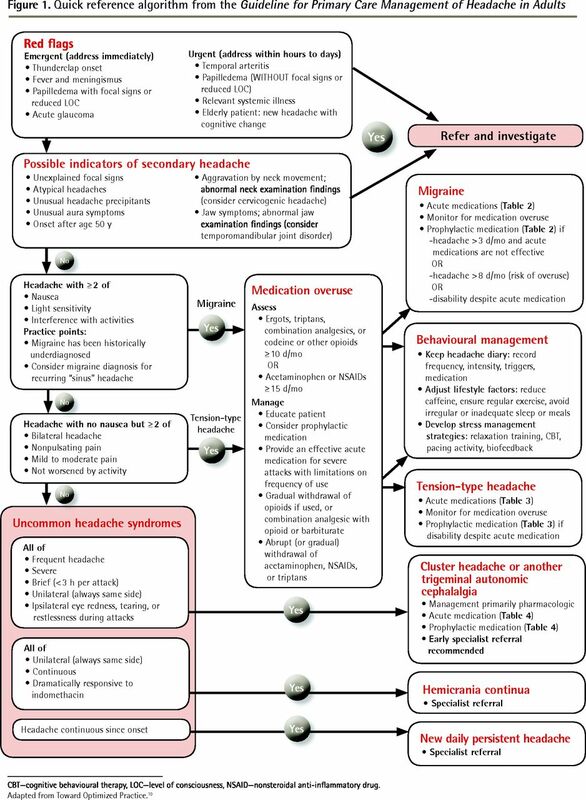 The International Classification of Headache Disorders: 2nd edition. Cephalalgia 2004;24(Suppl 1):9-160.
. CMA Infobase: clinical practice guidelines database. Record ID 13271. Ottawa, ON: Canadian Medical Association; 2013. Available from: https://www.cma.ca/en/Pages/cpg-details.aspx?cpgId=13271&la_id=1. Accessed 2013 Aug 26.
. Guidelines. Hamilton, ON: McMaster University; 2013. DeGroote National Pain Centre [website]. Available from: http://nationalpaincentre.mcmaster.ca/guidelines.html. Accessed 2015 Jun 11. Guideline summary. Rockville, MD: Agency for Healthcare Research and Quality; 2013. National Guideline Clearinghouse [website]. Available from: www.guideline.gov/content.aspx?id=47060&search=guideline+for+primary+care+management+of+headache+in+adults. Accessed 2015 Jun 11.